In February 2012, the Food and Drug Administration (FDA) Centre for Veterinary Medicine held a Webinar entitled, “Advice to Dog Owners Whose Pets Take NSAIDs.” The webinar, which is about half an hour long, contained a great deal of useful information, and the FDA has an archived version available on its website if you want to take a look. The link to the webinar and the presentation slides can be found on the FDA website by clicking on the following link: http://www.fda.gov/AboutFDA/Transparency/Basics/ucm291745.htm. In the webinar, information is presented about exactly what Non-Steroidal Anti-Inflammatory Drugs (abbreviated as NSAIDs) are, and what they do. Briefly, NSAIDs work by decreasing levels of prostaglandins in the body through inhibition of a specific enzyme that manufactures prostaglandins from other substances. 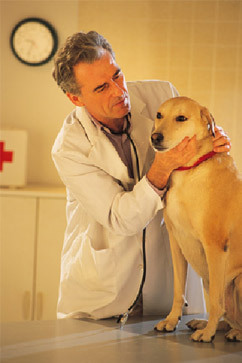 The primary uses for NSAIDs in veterinary medicine are reducing inflammation, pain, and fever. Like all forms of medical intervention, NSAIDs carry with them potential benefits and risks. Anybody who has taken a human-approved NSAID to treat joint pain, fever, etc. can attest to the upsides: less pain, greater mobility, and an improved quality of life. And the same is true for our pets. The most common adverse events associated with NSAID use in veterinary patients are vomiting, loss of appetite, depression, and diarrhea that resolve with discontinuation of the drug and appropriate treatment. Rarer but more serious side effects include stomach/intestinal ulcers with possible perforation, kidney and liver failure, and death. There are species-specific concerns with respect to the use of NSAIDs in animals. For example, cats lack the enzyme systems to efficiently break down NSAIDs, and thus are at a much higher risk of developing potentially serious side effects when given these drugs over extended periods of time. As an example, a single acetaminophen tablet may kill an average-sized cat. In the USA, no veterinary NSAIDs are approved for long-term use in cats, although in Canada and other countries there are approved products for use in cats. Our pets deserve to live a life that is as pain-free as possible, and NSAIDs are often the most cost-effective way of providing pain relief. The best way to determine whether the benefits of NSAID use outweigh the potential risks for your pet is to talk to your veterinarian, since each pet is unique and in many cases the benefits to your pet outweigh the risks. For pets that are unable to be given NSAIDs, your veterinarian can provide you with advice about other available options. If you are giving your pet an NSAID and you notice any abnormal symptoms, STOP giving the drug and call your veterinarian immediately. Adverse reactions need to be reported so drug safety can be monitored and appropriate steps can be taken to prevent further problems for our pets.